From the moment it enters our yard to the time our customer receives it, we take every precaution to produce a high quality properly dried product. The lumber we produce is native to our northern regions from the following species: Red Oak, White Oak, Hard Maple, Soft Maple, Walnut, Hickory, Ash, and Yellow Birch. 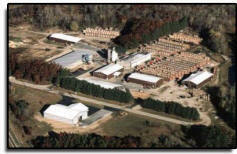 When pre-staging our kilns, the lumber is stored on an 80,000 sq.ft. concrete slab to provide a sound level surface which produces flatter, cleaner lumber. 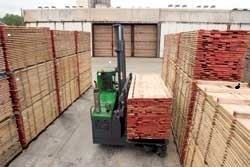 We carry a green inventory of two million board feet. We currently operate 250,000Bf of conventional dry kilns, which are closely monitored to ensure optimal drying for superior color and yield. All lumber is carefully inspected and graded before and after kiln drying by NHLA trained, customer conscious inspectors. Commitment to quality, pride in product excellence and customer satisfaction warrants that the every order contains the highest quality finished lumber.